The 2015 Chevrolet Cruze will have a new face and an interior that emphasizes convenience. The 2015 Chevrolet Cruze was revealed today ahead of the 2014 New York Auto Show. After weeks and months of speculation, the spotlight has at last been shed on the 2015 Chevrolet Cruze, which was unveiled today ahead of its physical debut at this week’s New York International Auto Show (NYIAS). 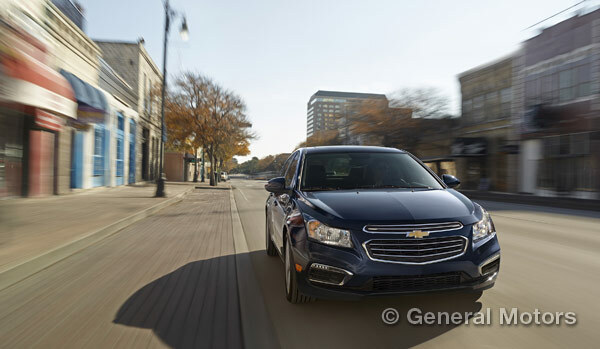 It turns out that the new Cruze is significantly revised but not entirely redesigned, with Impala- and Malibu-inspired design cues on the outside and an interior that emphasizes convenience and comfort above all else. The 2015 Chevrolet Cruze will sport a dual-port grille similar to that of the Impala and Malibu, but it will otherwise be largely similar to the 2014 model. Given the fact that the Cruze is Chevy’s most popular model, this doesn’t sound like much of a problem for the bowtie brand. Where the new Cruze will benefit most is on the inside (which, if mama taught us right, is where it counts): the new Cruze will have revised cupholders, a center console-located trunk release, and door locks relocated to the door panels. The new Cruze will also feature a Text Message Alerts feature for smartphone-wielding drivers with Bluetooth M.A.P. and Siri Eyes Free for iPhone users. The 2015 Cruze will get a standard 7” touch screen with USB ports, OnStar 4G LTE with Wi-Fi hotspot, and available navigation and Chevrolet AppShop (the latter will arrive sometime later this year). The 2015 Chevrolet Cruze lineup will consist of the LS, LT, RS, and LTZ trims, the Cruze Eco, and the Cruze Diesel. For more information on the new Cruze and its upgrades, stay tuned to The News Wheel!